Firenze table’s main characteristic regards its base: it is made with solid Canaletto walnut, or solid dark oak slats. 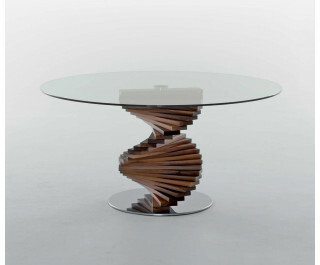 The slats are paired one by one, forming a spiral sculpture that creates an elegant optical illusion. A glass or porcelain stoneware top, available in different sizes, completes the structure. Tonin Casa’s originality, mixes precision, quality and practicality: the table, in fact, is available with both the single and the double base.